When looked after, a lawn is a great way of covering a large area of outdoor space with an expanse of colour. But of course, a lawn doesn’t come without its own maintenance, and if not looked after, it can make a garden look very unkempt and even unloved. Not everyone has the time or knowledge to maintain a lawn to ensure it looks its best. If you’re thinking about ditching the grass in your garden, there’s no shame in that. And if you’re worried about making sure your garden still looks lush and green? There are plenty of ways to add colour to a garden without grass. Small spaces lend themselves particularly well to being grassless. Paving small spaces but retaining space for planting by adding raised borders around the edges means that you can still have some greenery. If you have a little sun trap, why not paint the walls white to reflect the sunlight, and to give it a Mediterranean feel? Plant small palm trees, and bright colourful flowers and make sure to add plenty of pots in bright blues, yellows and reds. This way, you won’t miss out on the greenery of the grass. Don’t feel like a country garden needs a lawn to make it complete; you can still have an expanse of stones or decking, and keep the planting light and airy in order to give it that country garden feel. Add a gazebo or outhouse at the end of the garden, and paint that a sage green or a sky blue to add a dash of colour and to replace a large expanse of brightness in a subtle way. Then be sure to add plenty of lavender, hydrangeas and cosmos to create a pretty colour scheme. As removing the grass from a garden is a fairly modern concept, a lawn-less garden lends itself well to something more contemporary. Create something quite Zen like, with smart rectangular and square paving slabs, and plenty of water features in strategic places. Alternatively, make your garden a complete extension of your home and a hospitable place for entertaining. Use paving and decking to create an area which is perfect for al fresco dining. Add a relaxed seating area in another space, and install a permanent outdoor heater or chimnea for when the nights get chilly. 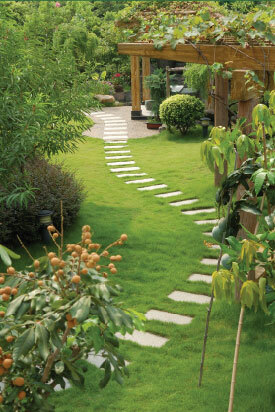 Adding focal points like this will mean that your garden won’t miss the grass. If you’re thinking of getting rid of the grass in your garden, contact Bespoke Lofts for a quote. We’ll make your garden look beautiful without the need for a lawn, and can also install artificial grass if you’d still like a lawn but without the maintenance. After all, the grass isn’t always greener.